The Golfstream Vision Trolley features Revolutionary Caddy White screen that can be seen easily in even the brightest of sunshine. 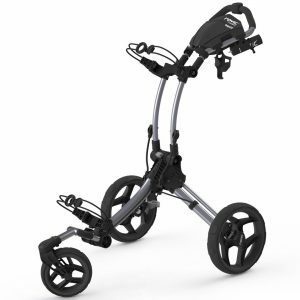 The front wheels feature housing to avoid clogging and this Golf trolley also has Super slick high grip PU rubber tyres that are durable and built to last. Your bag is held beautifully by two side arms without “perching” on the central beam to avoid bag wobble and the Vision Electric Golf Trolley folds flatter than most trolleys via a one touch super simple fold/unfold system. Golfstream’s Vision Trolley even lets you personalise the main screen to allow names and there is a simplicity mode for those who don’t want the fancy extras when using this golf trolley. The Trolley is powered by a Caddy Cell Lithium battery which is Super quiet yet powerful for an uninterrupted round. One touch super simple fold/unfold. Full livery colour swaps available. Super slick high grip PU tyres. Longer lasting PU tyres (5 times longer life than normal EVA). Speed increments in 0.5 to get the perfect speed to match your pace. Full programmable left handed operation. Super quiet drive train for an uninterrupted round. Sleek power platform to take all popular batteries. Supplied with LiFePO4 lithium battery as standard. Magnetic hold together latch for quick and simple hold. Designed in the UK for simple reliable operation. The Golfstream Vision Golf trolley has a two year parts and labour guarantee and 3 years warranty on the lithium battery.